Despite its rather technical nature, electric pulse fishing has been in the spotlight with increasing frequency due to the particular sensitivity of the topic. The environment, democracy, worker protection (fishermen in this case)... this controversial fishing technique draws in all the burning questions of the day. The Bloom association also has a stake in the matter. 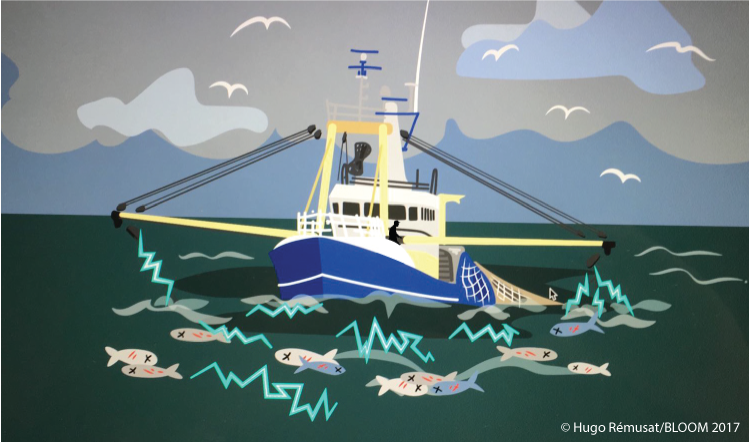 They take to the media to publicise their long battle against electric fishing, and inveigh against both the Netherlands and European institutions. At the start of November, Bloom denounced the illegal subsidies allocated to trawlers practicing the method deemed controversial by scientists. The history of electric fishing in the European Union begins in 1998, when it was banned. Everything changed in 2006, when a regulation on December 21 introduced derogations to the ban, in order to test the technique for experimental purposes. Derogations may be granted to a maximum of 5% of the fleet of each member state. This involves only those fleets operating in the North Sea. More recently, on November 21 2017, the European parliament's PECH committee voted 23 against 3 in favour of developing this practice. A few weeks later, the European Parliament held a vote on the matter during its plenary session: on January 16 2018, a clear majority (402 against 232) chose an absolute ban on the practice. That same day, the Dutch MEPs voted near-unanimously against the ban. Only Anja Hazekamp, member of the Party for Animals, supported the ban. While other countries also had majorities opposed to the ban, only the Netherlands reached such unity, involving all parties, greens included. This voting pattern is hardly a coincidence, and would seem to suggest that the Netherlands are the principal lobbyists for electrofishing. However, fishing represents a rather modest proportion of the Dutch economy, judging by its agricultural revenue, including revenue from fishing. Still, in 2017 it reached 1.86% of GDP, a higher proportion than that of their neighbours: 0.51% in the UK, 1.14% in Denmark, 1.10% in Sweden, and 1.51% in France. Elsewhere, the Netherlands faces stiff competition from its neighbours in the North Sea, and takes no place on the podium for Europe’s largest fishery producers. Electric fishing is a fast way to catch more fish, and for this reason fishing countries such as France and the UK oppose the practice, in order to protect their maritime workers who don’t have access to these techniques. For the Bloom association, the problem doesn’t end there: democracy itself is also at stake. Since the vote back in January 2018, derogations granted to Dutch trawlers have not stopped. Discussions are set continue concerning the future of electric fishing. Furthermore, following an analysis of subsidies allocated to Dutch fishermen, the NGO claims to have discovered irregularities. Back in October 2017, Bloom had already condemned irregularities in licences granted to trawlers for the practice of electric fishing. They discovered that 70 out of 84 licences were illegal, because they passed the 5% limit per fleet of each member state. What is new is that Bloom has revealed that all of these 84 trawlers have benefitted from European fishing subsidies. In total, 21.5 million euro of public funds have been unduly allocated to Dutch fishermen, for the development of electric fishing. To be precise: 14.3 million euro were allocated between 2008 and 2016, then 6.5 million starting in 2017. In addition, 2.7 million in subsidies were specifically allocated for otter trawling, which is not included in the derogation regime of 2006. For its part, the European Commission, contacted by VoxEurop, denies the accusations of illegal subsidies. However, according to a source close to the institution, it is currently obtaining information on the Dutch authorisation process. The Commission therefore defers to the State, sole authority for granting contested licences. It has, nevertheless, allocated 5 million euro to trawlers which practice electric fishing, but for projects which do not involve the practice, and 4.3 million into research projects intended for its development. It is now more than likely that the business of electric fishing will continue to arouse tensions for a good while yet.